Oh boy oh boy oh boy…I’m gonna do my best not to harp on this issue while I’m here, and only talk about the amazing dishes I try throughout the region. But yesterday I believe I had my (accidental) first ingestion of gluten in at least a year, and I’m still feeling it today – tightness in my chest, difficulty breathing, digestive pain. Not fun! (Don’t worry, it’s going away now.) One of the many challenges of living in a foreign country is figuring out what you’re eating. It occurs to me that this issue is made more challenging by one of two things: 1) not knowing the language, and 2) having a body that hates a lot of foods. It started out as a great Jaegerschnitzel. It’s true. 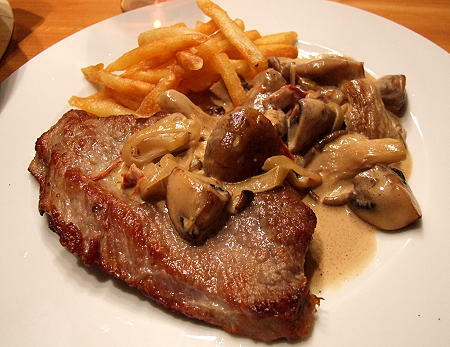 A thin slice of pork cooked to perfection and doused with mushroom sauce (which I believe had the offending ingredient), with a side of fries that was a surprisingly perfect match for the meat, especially when dipped in the sauce. I love German food and this was right up there. Delikat! By late afternoon, though, I noticed the symptoms starting. Did this stop me from eating my leftovers for dinner? Well, I had a few bites. So. Good. So not worth it. Oh Maggie, my sweet sweet sister, I have laughed out loud twice tonight thanks to you! Keep up your wonderful writing and keep exploring the way only you can. I can’t wait to travel along with you some day. Yay Sara, you’re here! Thanks for joining in and I’m so glad I could give you a laugh or two. Love you so much! !